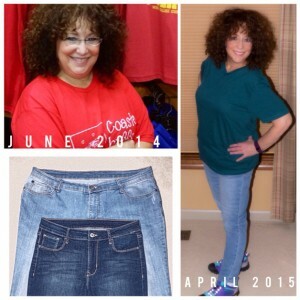 “I redid my before and after photo. I just posted this on my Facebook wall. I’ve gotten close to 40 likes, and over 12 comments, in less than 15 mins!!!! My agility friends are all telling me I’m looking great, and that I’m now so TINY! Many haven’t seen me in less than several layers of clothes, sweat shirts and winter clothing, since last summer. So this is a real change for them to see. Thank you so very much for helping me lose my weight! It’s weird, because, I have ALWAYS seen myself as my after. I never thought of myself as sooo obese. When I saw pix of myself, I hated them, because they made me look heavier than I really was… that’s what I *thought*! Now… I look in the mirror, but I see myself, looking the same as *before*. However, my clothes tell me, I’m MUCH smaller than I was before! Now I go through my closet, and put my old clothes on, that mostly *just* fit, to find they are so big, I can’t even TRY to wear them now!!! “I cannot begin to explain how my life has changed as a result of my weight loss. Since I needed to lose a lot of weight I did not even know where to begin. I saw a weight loss surgeon but knew that surgery was not the answer for me. I decided to look for a doctor that specialized in weight loss. After searching the internet, I came across North Shore Primary Care’s website and I decided to all and make an appointment with Dr. Weiss. This is where my journey began. The staff and nurses at North Shore Primary Care were so nice to me. They made me feel comfortable all the tme. Tin addition they were very accommodating to my busy schedule. When I met Dr. Weiss, I knew that she was going to be able to help me. Her kind demeanor and vast knowledge of weight loss really impressed me. She also took the time to get to know me. She always had solutions when I was struggling. “I have been a patient of Dr. Shana Weiss for about 7 years. Of all the primary care physicians I have had in the course of my 66 years, she excels in providing her patients with an exceptional doctor/patient relationship. Dr. Weiss takes all the time needed to answer my questions and always make sure that I grasp all the information she gives. She has such a strong commitment to her practice, and her entire staff is wonderful as well! It is such a comforting feeling to know that Dr. Weiss provides the best possible medical care. It sounds cliche, but they truly care about their patients versus other practices where you feel just like a number. When I have been in the hospital for various surgeries, Dr. Weiss has either stopped by to see me, or has phoned me to see how I was doing. If I have been in to see her, due to a more serious illness, she or one of her nurses, will phone the next day, to see how I am feeling! !” -C.W. “Recently on the national and local news broadcasts, there was a report that stated, “Only 1 in 10 physicians report back to their patients with lab and radiology reports even if the results of those tests appear to show serious problems. Dr. Weiss or one of her nurses will always call, as soon as they receive the test reports.” – C.W. “Thank you for your kind, caring, enthusiastic participation in my health. You are a great physician, and I’m glad you are MINE!” -N.D. Please do not submit medical or clinical questions to this address. Copyright 2011 - North Shore Primary Care 2011. ALL RIGHTS RESERVED.